Omgosh, I am smitten! Uhhhhhhdorable treat containers, Sherry! Love that scarecrow and his little pumpkin, and the matching wrapped candy is just the icing on the cake! Oh Sherrie these are adorable. Love the faces. The crow and pumpkin are too cute and the wrapped candy is the perfect touch to finish the box off. Love these and so will the teachers. Your treat holders are absolutely adorable! The scarecrow is so super cute and I love that sweet pumpkin! Oh my gosh, these could not be cuter, Sherrie!! I love the sweet faces!! The papers you used are beautiful!! The wrapped candies are fabulous!! Your doodling is always perfect, too!! Arya's teachers will adore these!! I love, love them!! Thank you so much for playing along at DL.ART!! I hope you have a fantastic weekend my sweet friend... and a very blessed and Happy Thanksgiving if I don't chat with you before then!! Oh how adorable! 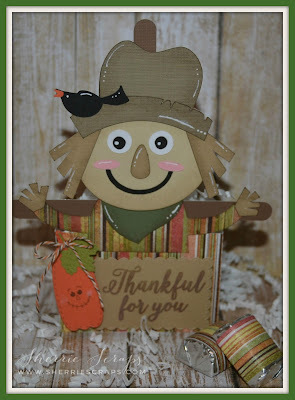 Your little scarecrow treat box is just as cute as can be, love his little friend on his hat too! 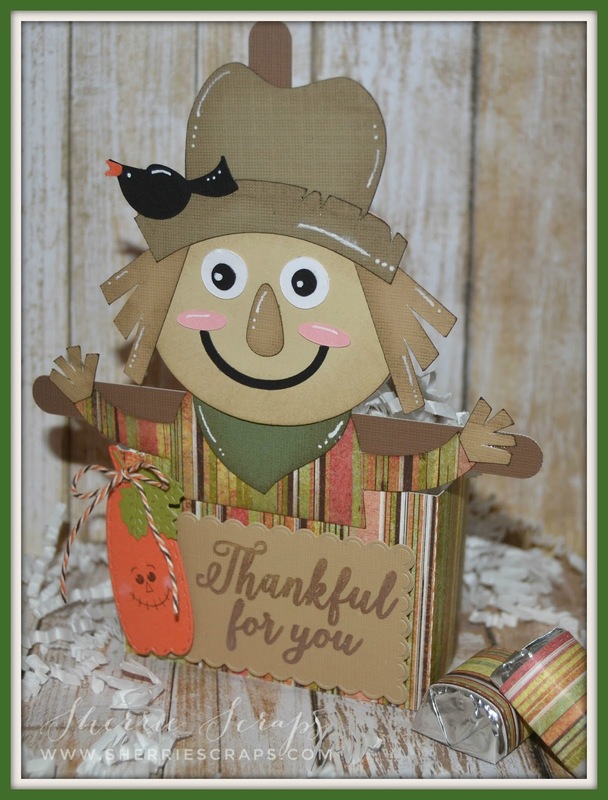 What could be more Fall than a scarecrow and pumpkin! They are absolutely ADORABLE! I love the cute pumpkins and JB sentiment.Oh! I love the pretty spiced pumpkin trendy twine bow! Oh my goodness! Those scarecrows are way too cute! Thanks for joining us at DCD's this week! awe these are tooo cute ! i love scarecrows !!! thanks for joining in on the Jaded Blossom challenge this month !!! SUPER DUPER Job my friend!!! cute little pumpkins too....Thanks for playing along at Jaded Blossom! Oh my gosh Sherrie, I am so in love with your little scarecrow!! I would love to be a fly on the wall of your craft room some time and see how you come up with stuff!! I am using this one for sure if you don't mind. I make a lot of fun little gifts and treat bags, though I never post them on my blog, but you are a great source of inspiration to me for the projects I put together!! Keep em coming my friend!! Adorable Sherrie!! Thanks for playing along with our challenge at Jaded Blossom!!! OMYGOSH!! Sooooooooooooooo cute cute cute!!!!!!!!!!! I love that scarecrow!!!!!!!!!!!! Oh, Sherrie, these are the sweetest!!! Love!!! Thank you for joining us at Jaded Blossom! These are so stinkin cute! Love those scarecrows! Thanks for playing along at Jaded Blossom! aw these are adorable!! Thanks for joining us at Jaded Blossom! 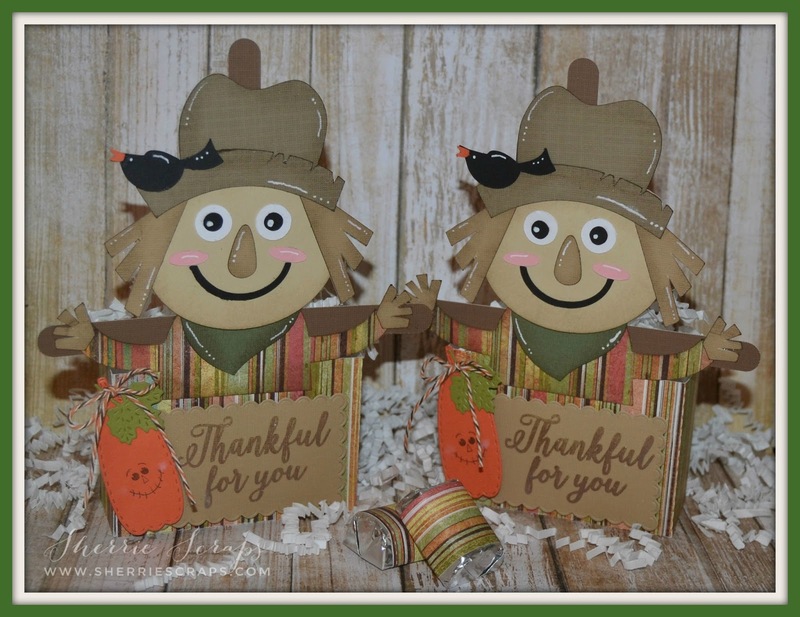 Adorable scarecrow treat boxes! Love them! Thanks for playing with us at My Sheri Crafts! Beautiful scarecrows!Thanks for sharing at Jaded Blossom's Challenge. Oh, my! These are just so cute and your craftsmanship is outstanding! What a lovely gift for the preschool teachers....I teach elementary school, and it is always such an encouragement to receive a handmade expression of love. So grateful you shared your project at Jo's Scrap Shack this week. These scarecrows are adorable!!!! Thanks for joining us at DCD this week! Have a great day. These are just so so cute! Absolutely gorgeous Sherrie. TFS and joining us this week at Jo's Scrap Shack for Funday Friday. Please take a moment to link up to Jo's website on your post - Thanks. Oh my gosh, these are so SUPER cute, I love the scarecrow and those pumpkins are adorable! These little guys are absolutely adorable! 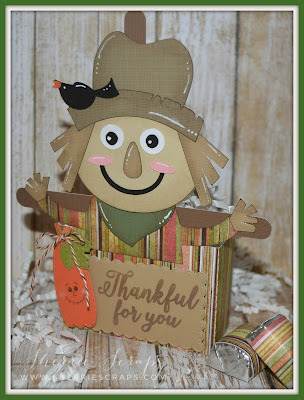 I always love scarecrows and these have the sweetest faces. I'm sure the teachers will love them!